Like many other composers also Widor passed through different phases in the development of his style of composing. He wrote salon music, chamber music and his four organ symphonies after his studies with Lemmens and Fétis. The other organ symphonies, the piano concertos, orchestral works, ballets, operas and mélodies were composed in his maturer years. 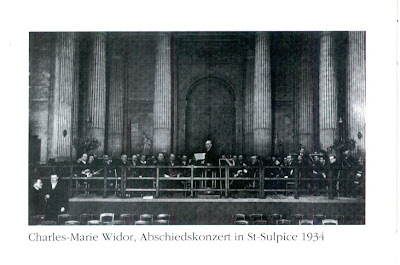 Being organist of Saint-Sulpice (1870-1934) Widor spent most of his lifetime in the service of the Church, apart from his activities as a composer and teacher. The Symphonie Gothique, the Symphonie Romane and the Sinfonia Sacra are all based on liturgiacl themes. 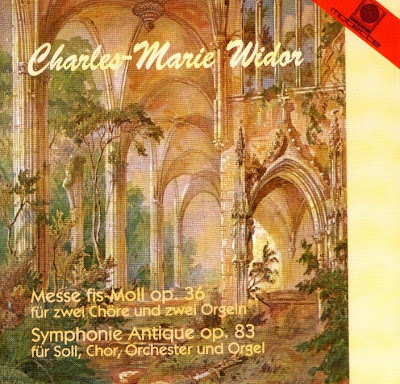 In the Symphonie Antique Widor used the themes of Te Deum and Lauda Sion. It is likely that Widor worked on this opus 83 for over two years. Widor himself conducted the premiere which took place on March 22nd, 1911, in the hall of the mansion of Widor's friend, the Comtesse de Bearn. The Gabriel Pierné conducted the first public performance at the end of December 1911. Two years later Widor had a great success when he conducted the Symhonie Antique in Dortmund, together with his first concerto. The symhonie is in four parts with the movements Allegro moderato, Adagio, Moderato (Scherzo) and Moderato. The first three parts are played by the orchestra alone before the choir joins in to sing the Te Deum Laudamus in the last part, the fourth movement. It is odd that the organist Widor has made very little use of "his" instrument in this great symphony. The organ only joins in the big finale, leading the choir and the orchestra to a majestic conclusion. The last part of the Symphonie Antique - which has found its way back to the concert programmes since about 1992 - is the wonderful Te Deum Laudamus, maybe Widor has never composed anything better than this for choir and orchestra. The Compact Disc was released by MOTETTE, 1996, (DDD). Motette CD 40181.